Ways to donate | Alzheimer Society of B.C. Want to support someone who is involved in an Alzheimer Society of B.C. event? Visit our Fundraising Events section for a list of upcoming events. You will receive an electronic tax receipt sent to the e-mail address you provided. Monthly donors will receive one consolidated annual receipt. Prefer to donate offline? Print and complete one of our donation forms. 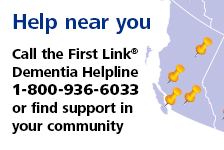 Forms can be mailed or faxed to the Alzheimer Society of B.C. You can also phone our Provincial Office toll-free at 1-800-667-3742 or phone one of our local Alzheimer Resource Centres. Your support is the crucial piece of the puzzle that enables the Alzheimer Society of B.C. for people impacted by dementia. For more information, please see our Annual Report and finances.